TAMPA, Fla. (WFLA) - A new policy at Frontier Airlines is raising some eyebrows and one big question — should you tip your flight attendant? 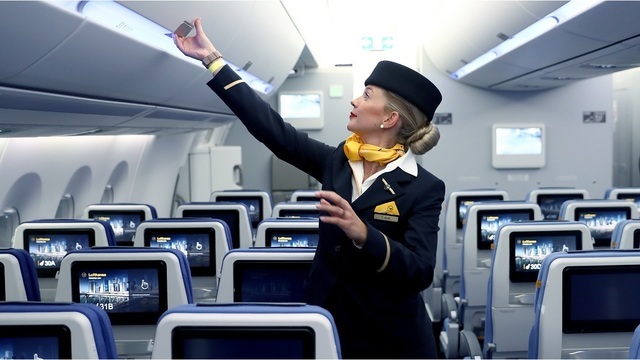 Three years ago, the Denver-based airline introduced a tipping function on digital tablets used to order snacks, which included an option to add gratuity. Until this year, the tips were pooled among flight attendants. But as of Jan. 1, they'll get to keep the tips they make from individual sales, the Chicago Tribune reported. “We appreciate the great work of our flight attendants and know that our customers do as well,” said Frontier spokesman Jonathan Freed. A tablet prompts passengers to tip 15%, 20%, 25% or a custom gratuity. The option to tip is “entirely at the customer’s discretion, and many do it,” Freed added. Flight attendants can choose whether or not to trigger the option on the tablet. “I’ve flown more than 350 flights on 51 different airlines in the past three years, but I’d never experienced an airline ask for a tip,” wrote JT Genter, of ThePoints Guy travel blog. Genter said the new policy may motivate them to provide better service, but "it feels a bit unprofessional for flight attendants to be seeking tips." The policy was also met with opposition by others in the industry. “Management moved forward with a tipping option for passengers in hopes it would dissuade flight attendants from standing together for a fair contract — and in an effort to shift additional costs to passengers,” AFA President Sara Nelson said, according to the Tribune. Flight attendants made a median salary of $50,500 in 2017, according to the U.S. Bureau of Labor Statistics.